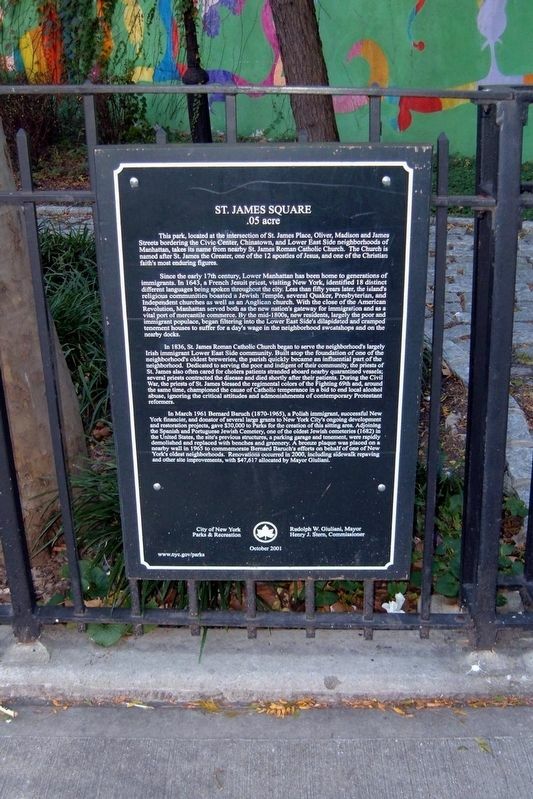 This park, located at the intersection of St. James Place, Oliver, Madison, and James Streets bordering the Civic Center, Chinatown, and Lower East Side neighborhoods of Manhattan, takes its name from nearby St. James Roman Catholic Church. The Church is named after St. James the Greater, one of the twelve apostles of Jesus, and one of the Christian faith’s most enduring figures. This Parks signage alludes to the actual shape. There is no sign of the Bernard Baruch plaque mentioned in the text. The Shearith Israel graveyard is alongside. In 1836, St. James Roman Catholic Church began to serve the neighborhood’s largely immigrant Lower East Side community. Built atop the foundation of one of the neighborhood’s oldest breweries, the parish quickly became an influential part of the neighborhood. Dedicated to serving the poor and indigent of their community, the priests of St. James also often cared for cholera patients stranded aboard nearby quarantined vessels; several priests contracted the disease and died shortly after their patients. During the Civil War, the priests of St. James blessed the regimental colors of the Fighting 69th and, around the same time, championed the cause of Catholic temperance in a bid to end local alcohol abuse, ignoring the critical attitudes and admonitions of contemporary Protestant reformers. In March 1961, Bernard Baruch (1870-1965), A Polish immigrant, successful New York financier, and donator of several large grants to New York City’s ongoing development and restoration projects, gave $30,000 to Parks for the creation of this sitting area. 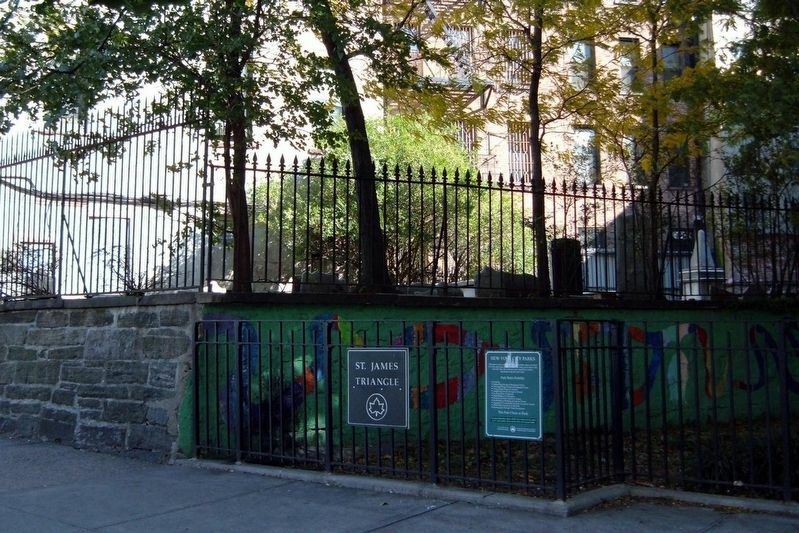 Adjoining the Spanish and Portuguese Jewish Cemetery, one of the oldest Jewish cemeteries (1682) in the United States, the site’s previous structures, a parking garage and tenement, were rapidly demolished and replaced with benches and greenery. A bronze plaque was placed on a nearby wall in 1965 to commemorate Bernard Baruch’s efforts on behalf of one of New York City’s oldest neighborhoods. Renovations occurred in 2000, including sidewalk repaving and other site improvements, with $47,617 allocated by Mayor Giuliani. Erected 2001 by City of New York Parks and Recreation. Location. 40° 42.768′ N, 73° 59.917′ W. Marker is in New York, New York, in New York County. Marker is on St. James Place near James Street, on the right when traveling north. Touch for map. Marker is in this post office area: New York NY 10038, United States of America. Touch for directions. Other nearby markers. At least 8 other markers are within walking distance of this marker. First Shearith Israel Cemetery (a few steps from this marker); The First Jewish Cemetery in the United States (within shouting distance of this marker); PFC Frank Vallone, USMC (within shouting distance of this marker); Hall of St. James’ School (within shouting distance of this marker); St. James' Church (within shouting distance of this marker); Padre Felix Varela Morales (within shouting distance of this marker); Ancient Order of Hibernians (within shouting distance of this marker); Alfred E. Smith House (within shouting distance of this marker). Touch for a list and map of all markers in New York. More. Search the internet for St. James Square. Credits. This page was last revised on April 14, 2019. This page originally submitted on April 10, 2019, by Larry Gertner of New York, New York. This page has been viewed 40 times since then. Photos: 1, 2. submitted on April 10, 2019, by Larry Gertner of New York, New York. • Bill Pfingsten was the editor who published this page.